If you’ve read our blogs about what a great country Australia is for international students, you may well have decided to study there. With the array of breathtaking sights to visit whilst you’re over there, and the number of well respected law schools, it’s easy to see why many students choose to study in Australia. If you’re trying to decide where to study in Australia, we’ve collected the most popular cities for students. This list factors in Student Mix, International Rankings, Desirability and Employer Activity according to the QS Best Student Cities Rankings. And all of the places below offer high-quality education in a stunning location. Melbourne is the cultural capital of Australia and ranks consistently highly as one of the best student cities in the world. The city has seven universities to choose from, which all rank internationally. It’s a popular city with international students due to its multicultural nature. It is the highest ranked Australian city in terms of Employer Activity and University Rankings. Melbourne’s stunning beaches, high standard of living and the array of comedy, music and sport events on offer give the city a high Desirability score. Despite Melbourne being one of the most expensive cities in the world to live in, it comes in at number 1 on this list. In at number two is Australia’s largest city – Sydney. This city actually ranks the highest in terms of Desirability as it offers a particularly high quality of life, with stunning beaches and green countryside. Sydney has two universities that rank within the top 50 QS World University Rankings with five others that are well-respected throughout Australia. The city has a high score for Student Mix with a quarter of students in Sydney being international students. Sydney also ranks quite high on Employer Activity which has helped to put it into second place. It’s Australia’s capital, Canberra, that comes in at number 3 on our list. Its large and diverse student population means it scores highly in terms of Student Mix, making it an attractive city for international students. Its second highest score comes in the form of Desirability as it has many attractions, nature reserves and even a man-made lake right in the city centre. Its only drawback is that it is not within walking distance to the sea! However, it does make up for that by being the home of Australia’s highest ranked university – Australian National University. 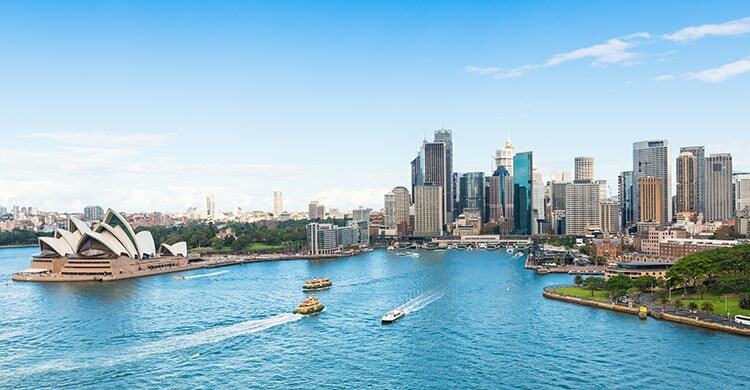 This up and coming Australian city has placed at number 4 in our list. Brisbane has three major universities and a large student population. However, it’s also a very touristy destination so isn’t strictly a student city. The city itself offers a mix of sunny beaches and outdoor activities, and cosmopolitan, urban nightlife. International students love Brisbane because it is widely considered as an extremely friendly city. The fifth largest city in Australia is Adelaide and is the last entry on our top 5 cities. Three of its universities are ranked in the QS World University Rankings: University of Adelaide, University of South Australia and Flinders University. Adelaide scores highest in the Student Mix category as it has a large and diverse student population. The city itself is beautiful with open parks and wide boulevards. Living in Adelaide gives you the opportunity to venture away from the city centre, into the hills, where you can engage in a range of fun outdoor activities such as wildlife watching and cycling. Hopefully if you’re thinking about studying in Australia, this guide will have given you a little bit more information on which cities are the best to study in. However, if you’d like to find out more about specific universities, please don’t hesitate to get in touch with us. « Where should I study in the UK?